Rainy Day Thoughts: When is a painting finished? A painting is never complete. I never set aside a painting until I can look at it for a long time without it telling me it needs changes. I never stop painting until it resonates emotionally with the mood of the beholder. Also for story illustrative paintings, they are never satisfying me until they communicate to others. 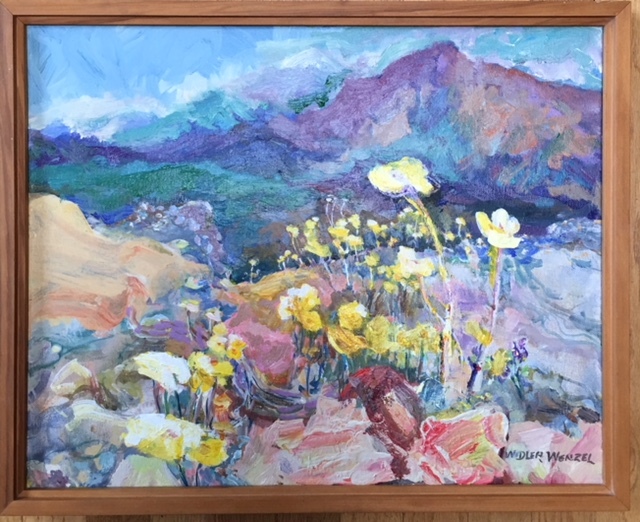 A neighbor brought back a painting I had originally finished eleven years ago and I had given the neighbors as a wedding gift about ten years ago. It had darkened hills as though a rain storm was coming. The image of it on their wedding announcement had lighter hills. Apparently I had darkened them to make the yellows stand out as happy perky survivors. After all this time I could see my last minute changes gave the painting an overall feeling of foreboding. This is how the painting looks after taking a few minutes to paint over the the mountains and green up the valley. Now the neighbor says the painting is after the rain instead of before the rain. 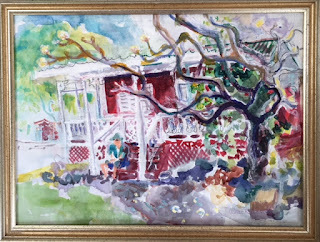 The original of the Greenwell beach cabin that I thought was finished in Hawaii seemed incomplete when I looked at it hanging at home. With white lines suggesting back lighting, I popped out the plumeria tree, added definition to child gate on porch, added some fallen flowers. The white on the plumeria's branches did not help so I removed most of the white lining and now it is like the original with very small changes. 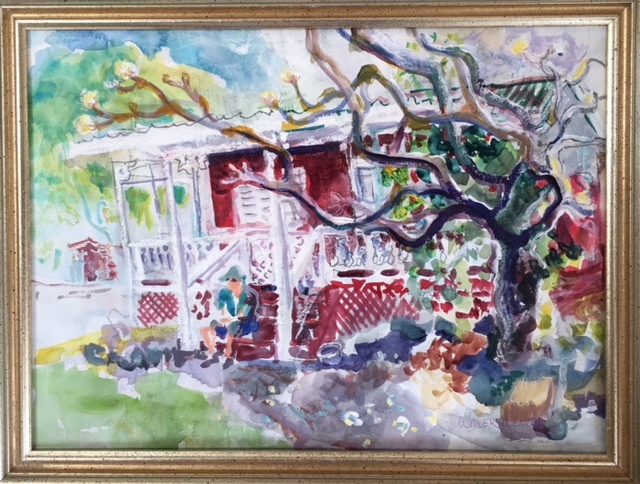 Of all the on location paintings I did in Hawaii in February the wedding painting was by far the most painted over and over. I had no fear of overworking it. 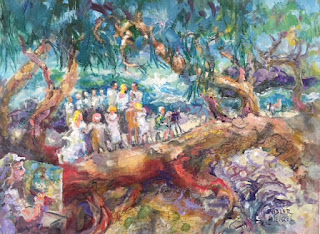 At first I had an uneasy feeling about the wedding but as time went by my feeling was for weddings in general so the painting took on the dreamy atmosphere of hope. 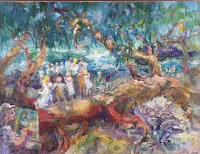 When the wedding painting was almost complete, but I was not sure, I shared it with the Tuesday Critic Group at the Old World Delhi in Corvallis. I like to hear critics of my new story paintings to make sure people see my story. I received good feed back. The log and sand was ambiguous. The painting had a hole in back of the log - a difficult problem for painters. To my fellow artists the log looks like ground. So at home I made the sand lighter to define where the log ended. 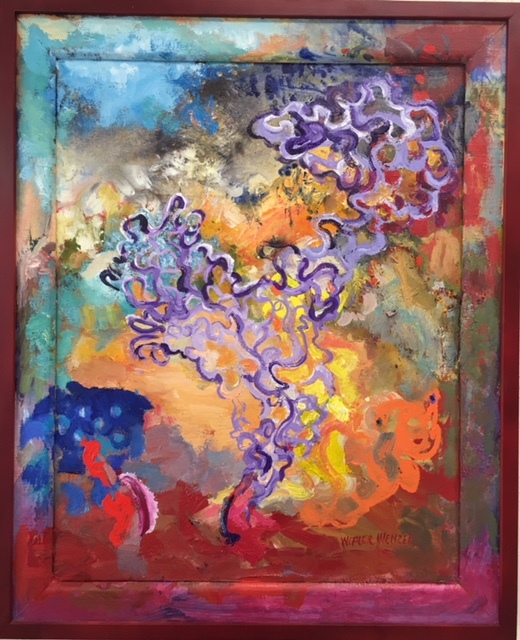 Another painting hanging up on trial is of fan coral. I thought it was finished in January, but it is still in question hanging up in our kitchen/ dining area. Living with it for awhile, I may decide but another way to decide is to put it in a closet for a few months until I can look with a fresh critical eye. This is how the painting looks now. This painting was started years ago of an entirely different subject. 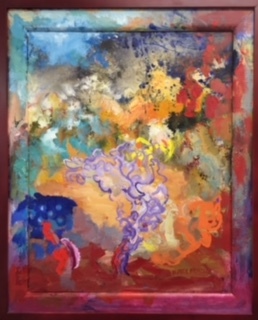 North Albany Autumn has become a poetic interpretation of Belize fan coral and fish. My belief is never be afraid to overwork a painting. Working on an exercise is nonsense and an easy excuse for abandoning the work that could transform itself many times. Paintings are not suppose to be perfect. Paintings do not need to be finished; they are part of an ongoing learning experience. Books can be that way too with always finding ways to tweak something. I try to avoid rereading my older work for that reason unless I am in the mood to edit. 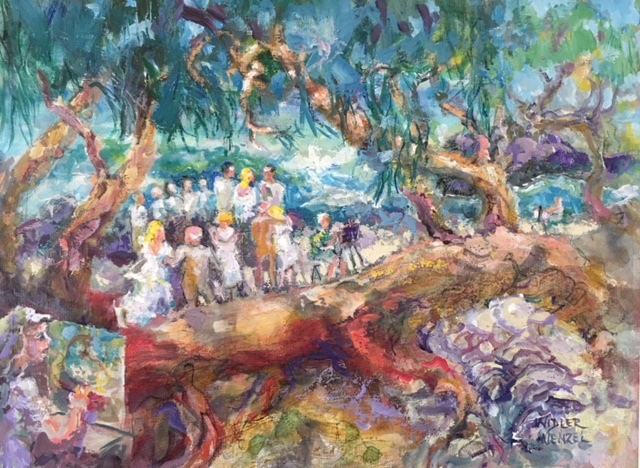 The tree limbs in the wedding painting seem a little threatening to me but maybe it's the photo. They twine like a trap. I wonder with that painting where either the wedding or the artists are in conflict is your feeling at the time that maybe the art group could have moved to let the wedding have its locale, since weddings happen once but art settings could be flexible. Too bad the park didn't allow for reserving spaces for those who want to have a wedding. It does end up in the painting showing the conflicted objects of interest. I feel confirmation by your observation on my initial intention of expressing a certain uneasiness about this wedding. Most see it as being dreamy which at first didn't match my intention. As I painted on it at home I opted not to paint a tangle of dark dead twigs hanging from the interlocked branches. I kept my initial intention of painting Some roots red to show the joining of blood lines and the lava preventing them from penetrating deep into the soil. There was the groom's mother but not the bride's mother. The groom's mother was nervous about what others in the wedding party would say about not having the whole beach. The groom's mother stood on the bride's side next to the father of the bride and the bride's sister. There was a very long serman. And the reception was also on the beach followed by photographs. They were still taking photographs and celebrating when we moved back to have lunch and our critic. So the photographers had freedom to photograph from all angles. There were not many locations to set up an easel so we would have had to go to another cove a long distance away. It would have been particularly difficult for those painting in oil.